Cape Elizabeth- Carl Walter Johnson 84, of Cape Elizabeth, died peacefully on Thursday January 10, 2019. Born in Portland, Maine on November 28, 1934, Carl was son to Carl and Anna Johnson. Carl is predeceased by his wife of 43 years, Mary Elizabeth Johnson and survived by his brother Paul Johnson and niece Krista Johnson. Carl completed his education in South Portland schools and enlisted in the Navy at the age of 17. While Carl’s working career included jobs in the airline industry, funeral care, auto and trucking mechanics with both Hannaford and Shaws he was, by far, most proud of and best known for his service in the United States Navy. To know Carl is to hear him say “When I was in the Navy…” Those fortunate enough to hear Carl’s Naval stories and adventures were left laughing and wondering how both he and the Navy survived his time aboard the USS Robinson. Carl lived his life to the fullest. His first and true love was his wife Mary, for whom he did anything and everything. Together he and Mary raised and cared for their many dogs- the final being sweet Mindi. Carl had incredible talent for wood working and model boat building and those closest to him often received amazing and personal structures built inside of tiny bottles- humorous and thoughtful tokens of Carl’s affection for them. 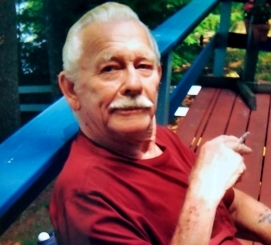 Carl’s true happiness was found on Thomas Pond where he was surrounded by the love and friendship of neighbors he always described as his family. He loved sitting on his deck with Mary and welcomed all who joined them. He would often be found driving his Chris Craft, gardening, enjoying campfires and parties, listening to the loons, and above all else helping his neighbors when in need. Thomas Pond has lost a little bit of it’s magic with the passing of Carl Johnson- we will love and miss him always. A.T. Hutchins Funeral and Cremation Services proudly serves Portland ME and the following (but not limited to) communities : Brighton Corner and Deering Center ME.